We are always on the lookout for unique and quality items. The Spud products were just what we need in Australia so I started bringing them over. 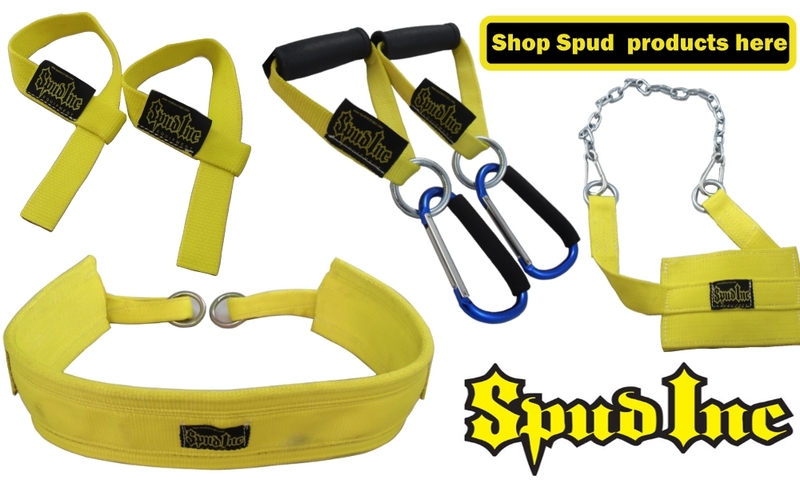 After watching many of their youtube videos, I knew we were on the same page as Spud Inc. Not only were the products designed for extreme and heavy lifting, you could use many of them for multiple purposes. We have found after playing around with many of the spud straps, they are perfect for adding variety to your Powertec leverage gym training. The other great thing about selling Spud Inc products in Australia for a while now, is they are constantly coming out with great new products. The trademark yellow nylon strapping has proved itself to be very versatile in so many applications - it is just so strong that it never looks like breaking. At the same time, even when it is brand new, it so comfortable. Whether it be on a pair of lifting straps or a deadlift belt, you just do not have to go through a wear in period like you do with similar nylon or leather products. Eventually I would like to get the entire Spud range. But if there is a product we do not stock, and you would like it, just let us know and we can bring it in. We order every fortnight, so we are constantly receiving orders. Also if we know there is a demand for a product that we do not currently stock, we are only too happy to add it to our range. Very helpful honest and friendly. very easy to deal with. ..
Bought some attachments for the bench. Very happy about it. .. The guy's at Sam's Fitness are fantastic - they are very professional and provide a high standard of customer service wh.. I recently purchased a Home Gym off Sams Fitness & can honestly say that I am very satisfied with everything. They answ..
Great product, good communication, will shop there again! ..